Many thanks to the latest issue of Films of the Golden Age. Photo courtesy of John Cooper. 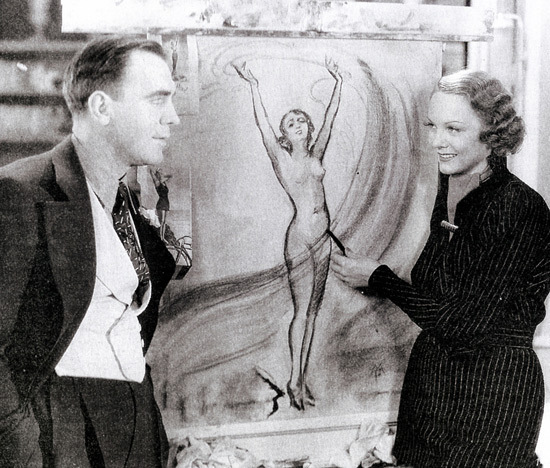 While having a fling with married boxer Ritzy McCarty (Pat O'Brien), wealthy commercial artist Patricia Merrill (Claire Dodd) explains why her charcoal won't draw certain parts of the female anatomy in the 1934 Warner Bros. film "The Personality Kid." I think the real fantasy element here is that she can draw non-nudes and still hold the title of "wealthy commercial artist".